The Duke and Duchess of Sussex were kept up in the air slightly longer than planned as their flight into Sydney had to temporarily abort its landing. Another aeroplane on the runway that was too slow to move meant the charter jet carrying Prince Harry and Meghan could not land as initially scheduled. The Qantas pilot urged passengers to look on the bright side, promising "another great view of the harbour". An announcement from the flight deck said: "There was an aircraft on the runway a little slow to roll... so the decision was taken to abort the landing." BBC royal correspondent Jonny Dymond, who was on the flight, said that as the plane approached the runway, the pilot spotted that a preceding plane had not quite taxied away. "Such aborted landings are not extraordinary events. At no point was there any risk to safety of the Duke and Duchess," our correspondent added. 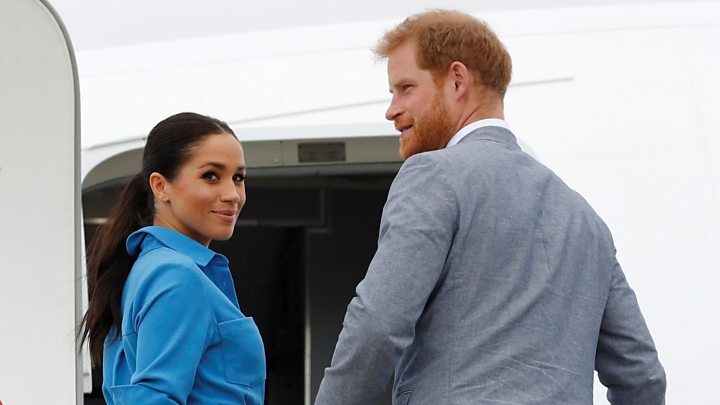 Prince Harry and Meghan boarded the Qantas flight in Tonga as they continue their 16-day tour, which ends in New Zealand. Their route to the aircraft was lined with handmade tapa mats and children from local schools waving them on their way. Earlier, they had joined Princess Angelika and Prince Ata, King Tupou VI's son and daughter, at a centre displaying traditional crafts. Princess Angelika said the duke and duchess were "an inspiration to the youth of the Commonwealth" for "shining a light on youth empowerment". Prince Harry and Meghan also visited the wooden, whitewashed Royal Palace for an audience with King Tupou VI and his wife, Queen Nanasipau'u. On the steps of the plane leaving Tonga, the couple stopped to say goodbye to the princess. "Thank you so much for your hospitality," Meghan said.